50ti Priya Galpa of Ashapurna Devi which was edited by Nupur Gupta. 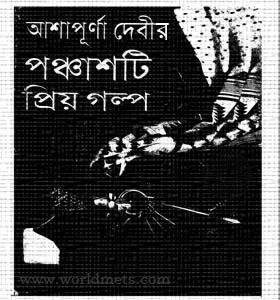 Shrimati Ashapurna Devi, famous writer of Bengal, has published fifty stories in one volume. The book was edited by Nupur Gupta.The book was published from Calcutta. Ashapurna was a goddess, novelist short story writer and child literary. On 8th January 1909 Friday, She was Born at Pataldanga of North Kolkata. His ancestral home was in Begampur village of Hugli district. His father was Harendranath Gupta and Sarala Sundari Devi. Many popular novels, stories were published in popular newspapers of the era. The West Bengal government gave him the highest honor of West Bengal, the ‘Rabindra Award’. The Indian government also awarded him the highest literary award of the ‘Sahitya Academy Fellowship’ of India. Ashapurna Devi’s birth centenary has brought a tide – what is the reader’s society in the world of publication? This tide has inspired the writer’s efforts to learn new, the passion of evaluating his writings. ’Ashapurna – Literature’ is a rich mining which is being arranged in the light of other foresight. Ashapurna Devi had a completely different feeling about short story writing. Any weakness in mind While publishing his best-known story, he gave a few speeches about what is particularly relevant. “Over 50 years of wind, the wind is blowing on the pen, in the flutter and in the sky, there has been a lot of change in society. The social mindset has changed. Changed the eternal values Again, in the air, the writers’ pen and language changed in the form of the application, the rules of application, the overall view”. It is truly blessed that the ‘Sahityam’ publication has begun to publish the “favorite story” section with 50 short stories in the birth of the hopeful goddess. The stories have not been selected according to the time but one thing to mention is the story of the ‘spouse and beloved’ story of Ashapurna Devi’s first published story in 1936, in the Sharadian issue of Anandabazar. It is not possible to discuss such stories, but it can be assured that every heart is bound to win. Although the reader may feel a little ruthless, the rough intensity of the truth is a bit rough. The author Ashapunra Devi says that some of the people living in my pen are bound in the boundaries and boundaries of my pen. So the stories of these stories are short stories. Yet there are so many different colors of taste. How many diversity and complexity, magnitude and tension. It is also possible that in a moment of time, life can completely change. And when these are caught, the feeling is how helpless people are. That helplessness may be to them To greed, closer to desire, closer to emotion. The short story work is to keep the momentum uncovered that touch the heart of the reader, a sympathy will awaken. After following the short story, I can write a short story of my love, I will not be happy, but if the success of the construction is the joy of creating little. Below are the short stories of this book. Hope this book will be appreciated by the reader community. The stories that were presented in the book, each story is about the general society written in her high profile. There is no story written about love, yet another story involves deception love. Get the Fifty Stories in one Volume of Ashapurna Devi as pdf here below the link. Fifty Stories in one Volume of Ashapurna Devi.